The Virgin Mary received the good announcement and gave the good announcement, and divine and human things, of heaven and earth, the original and saving plans of God for the salvation of man, were announced. This annunciation, this news of great joy for all mankind, is found in the mystery of today’s feast. God the Logos becomes what he had never been, that is man, while remaining God; and the Virgin Mary became what she also had never been, a mother but a virgin at the same time, before she gave birth and after she gave birth. How different is man from God and how much is man altered from God? The Virgin Mary as an Ever-Virgin celebrates the mystery of the Incarnation of the Logos of God, and that is why she is the only blessed woman. The conversation of the Virgin Mary with the Archangel Gabriel presents us with the difficulties and the impossible things that cannot be done, but for God everything is possible. The Virgin Mary is surprised by the joyous message and asks how and in what way she could become Christ’s mother. In these difficult responses of the Virgin Mary, the Archangel responds, “The Holy Spirit will come upon you, and the power of the Most High will overshadow you. 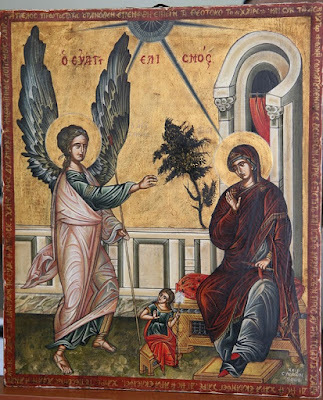 So the holy one to be born will be called the Son of God.... For no word from God will ever fail.” Do not be afraid, says the Archangel to the Virgin, do not worry. These words were kept in secret and were concealed by the Righteous, the Patriarchs and the Prophets. These words are not only the beginning of salvation and of the joyous announcement, but are also the proof that wherever divine grace exists, God makes everything possible. The Archangel called the Virgin Mary highly favored and “blessed”, not only for her beauty but also for her virtue, holiness and piety, which were unique in the world. “The Lord is with you,” the Archangel Gabriel says to the Virgin Mary. Many people wanted to hear this exhortation, many wanted to see and witness His presence in the world, but they did not have the chance. The Annunciation seems strange to our logic and thought, but also all these seem strange to every human mind. The Annunciation with the Incarnation of Christ is not only introduced to created reality, it is part of it, as a complete and perfect man and God. The history of mankind becomes even more interesting, even more existentially imperative for God’s interventions in the world and with man. The Annunciation also shows us that the Virgin Mary knows very well how a person, overwhelmed by the demands of life and faith, feels. When we feel helpless and, even, unable to cope with reality, the Virgin Mary gives us the answer. "What is impossible for man, is possible for God," she tells us. The realization of these impossible things that became reality at the Feast of the Annunciation, stimulated the enslaved Greeks in 1821 to try for the impossible, which became feasible. Today, we have been spiritually and historically liberated. Let us live this freedom, because always the impossible can actually be achieved in our own private everyday life.